Interesting note from Paul Krugman on the groups missing from American politics. 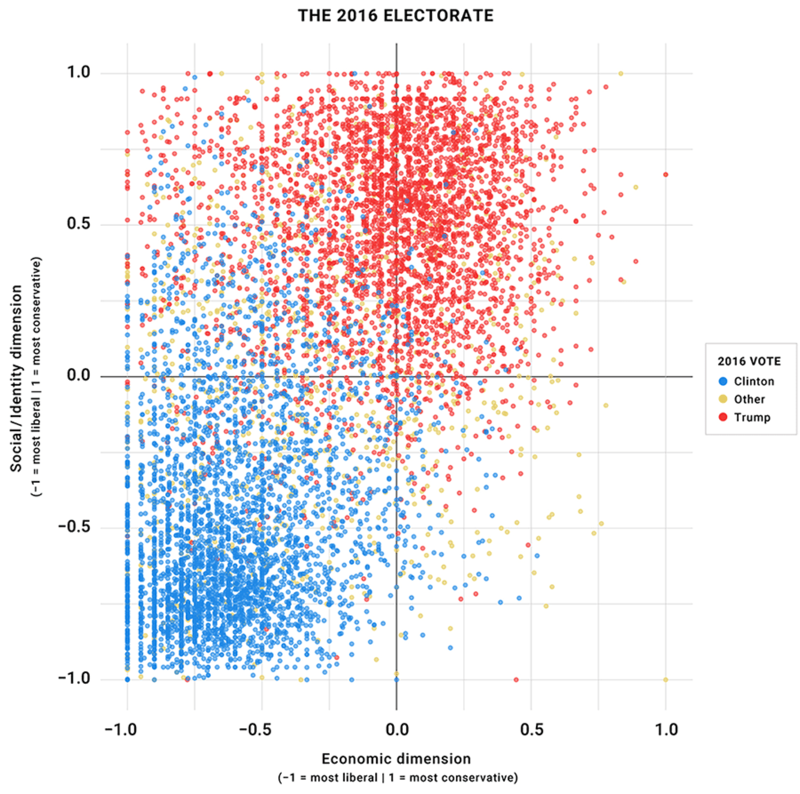 We have long had a habit of dividing voters into liberal vs. conservative along two axes, economic and social. 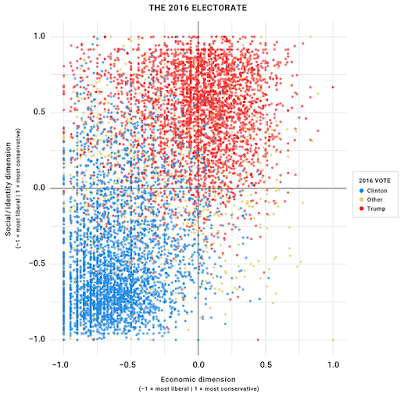 The chart above (stolen from the Times) shows that there are a lot of voters in three of the four quadrants: liberal along both axes, conservative along both axes, and socially conservative but economically liberal. Few voters identify with what you might call the libertarian quadrant, economically conservative but socially liberal. This is why the presidential campaign of Starbucks billionaire Howard Schultz is going nowhere; he explicitly announced himself as the candidate of those people, who make up only 4 percent of the electorate. On the other hand they are very well represented in the American elite, especially on the west coast. I remember hearing a consultant who helps big tech companies respond to public relations blowups say that everyone in Silicon Valley is socially liberal and economically libertarian, and since everyone they know feels the same way they are startled to learn that the rest of the country does not agree with them. Welcome to America, Mr. Schultz. The other of the two great absences in American political life is the lack of economically liberal, socially conservative politicians — let’s be blunt and just say “racist populists.” There are plenty of voters who would like that mix, and Trump pretended to be their man; but he wasn’t, and neither is anyone else. . . . Personally as you all know I think “racist” is an inadequate way to characterize that quadrant of American politics, which also has major elements of nationalism, love of the military and its values, fear of crime and disorder, and a nostalgia for simpler times. I admit, though, that it is certainly a major element in that coalition and it would be very hard to carry that group without a tolerance for racial language and thinking that no Democrat can possibly endorse. Thus these people feel homeless in American politics. That explains, I think, their love of Trump; he seemed to take their side and endorse their values at a time when nobody else did. Now that Trump has shown his colors on the issues of taxes and health care and generally behaved like a buffoon, he will probably get their votes but not their love. One of the big questions in American politics over the next decade will be whether any politicians emerge who really are socially conservative and economically liberal, and whether any of them mount a nationwide challenge in the George Wallace mode. Britain "listened" attentively to these no-information, unrepresented voters in the Brexit referendum and they have spent two years in chaos heading to oblivion. Never give your pet a vote on his trips to the vet.